Khandela , a town in Sikar district is an important Thikana of Shekhawat Rajputs, It is inhibited by direct descendants of Raja Raisal Darbari. However there is a division in two parts name Bada pana (Senior) and Chhota Pana (Junior). Raja Sajjan Singh of Khandela – Junior was a founder member of Jaipur Polo Club. 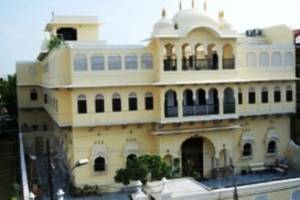 A heritage hotel in Jaipur is also managed by the current royals of Khandela which is liked very much by the tourists. Other than Shekhawat Rajputs, the traders community (Marwari) is also the prominent one. Maheshwari, Vijayvargiya, Sarawgi & Khandelwal clans trace their roots to Khandela. The town is in proximity of other tourist destinations i;e Lohagarl and Sakambhari Mata Temple. The current Member of Parliament (Mahadev Singh) of Sikar also hails from the town. 1- The fort in Khandela is the main attraction, it is well maintained by the existing royal family, the restoration and maintenance work is done as and when needed. Shri Raisal Singh Khandela (Shekhawat Clan) is the current custodian of the Fort. 2 -There is a line up of other magnificent mansions (Havelis) built by Maheshwari and Khandelwal clans of trading community, a big temple known as Khandela Dham (Picture on Left) is also built recently. 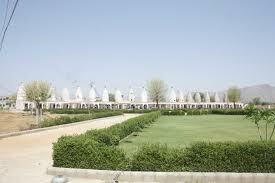 Ghateswar temple , Karamati Bai Ji Maharaj Temple and Bihari Ji Temple are the famous ancient temple. The location of Khandela is very beautiful in itself, the town is surrounded by hills of Aravali range and also there are few natural water reservoirs in the surroundings. 3- The furniture art and Gota Kinari work by local muslim artists of Khandela is also famous, you can easily found regal and aristocratic fixtures in old mansions of Khandela. Although the town is not directly connected with Railway but one can take the road route to make the journey comfortable. It is 57 KM from Sikar, but you do not need to go Sikar while coming from Jaipur. Palsana is a place from where you can take a right turn to reach Khandela. The nearest airport is Sanganer International Airport Jaipur. khandela fort is now turns into an hospital and one part of it into heritage hotel by Raisal Darbar. it is nice information. i need some more about the chotta pana badda panna . please give me the information about that. It is nice and very short information but plz give more deliberately because we need more about this place. Plz update it regularly. Most of the things are missing, just like kantli river, historical temples etc. Please mention the Narsingh temple of khandela.